Can someone explain the reasoning behind these values in the equations? You have to imagine a cube with spheres (the atoms) on the corresponding locations. Now you have to look at how much of each of these spheres is inside the cube (please see Patrick Moloneys answer for very descriptive images). For Simple Cubic: You have spheres on all 8 corners. Because the spheres are on the corners of the cube, only $1/8$ of each sphere is inside the cube, while $7/8$ of the sphere are on the outside. Now, you have 8 spheres on the corners, giving you 8 times $1/8$ of a sphere. So there is $8 \cdot 1/8 = 1$ sphere inside the cube. For Body Centered Cubic you have a sphere completely inside the cube additionally to the 8 on the corners ($8 \cdot 1/8$). Now we add the $1$ on the inside, giving you a total of ($8 \cdot 1/8) + 1 = 2$ spheres inside the cube. Face Centered Cubic has the same 8 spheres on the corners ($8 \cdot 1/8$) and an additional sphere on all the faces of the cube. 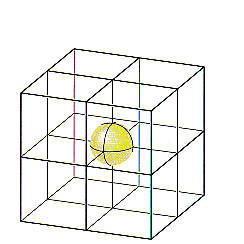 For each of these spheres, only half is inside the cube, while the other half is not. There are 6 faces, giving you $6 \cdot 1/2$ spheres for the faces. Add these to the corner spheres and you get $(8 \cdot 1/8) + (6 \cdot 1/2) = 4$ spheres inside the cube. Atoms on the corners, edges, and faces of a unit cell are shared by more than one unit cell. An atom on a face is shared by two unit cells $\implies$ half an atom belongs to each unit cell. What does this have to do with the equations? Charge density is the amount of charge per unit volume but what is charge?